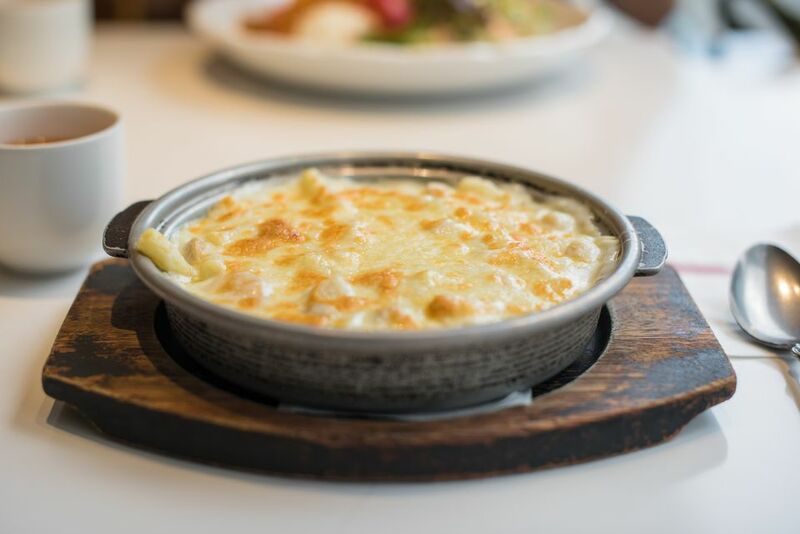 Seafood au gratin with fish and crab or shrimp. This is a delicious seafood twist on a traditional comfort food recipe. It gets a slight kick from Tabasco sauce, matching savory with spicy. This recipe serves 6 but can easily be scaled up for large parties. Arrange fish fillets in single layer in greased shallow baking dish. Sprinkle with wine, lemon juice, salt, and hot pepper sauce. Dot with 1 tablespoon of the butter and cover dish tightly with foil. Bake in a preheated oven, 400 F, until fish flakes easily with a fork; about 25 minutes. Cool, then carefully drain off broth into a cup or bowl; measure 1 cup of fish broth and set aside. Top the fish with crabmeat or halved shrimp. In a saucepan over medium-low heat, melt remaining 2 tablespoons butter. Stir in flour until smooth and bubbly. Stir in fish broth until thickened and smooth; remove from heat. Beat together egg yolks and half-and-half, then beat in a few tablespoons of the hot sauce from the saucepan; return egg mixture to saucepan, whisking briskly. Return to heat and cook, stirring, until slightly thickened, about 1 minute. Pour sauce over fish and shrimps; sprinkle with Parmesan. Broil about 5 inches from heat until fish is hot and the top is lightly browned about 10 minutes. Can be served with hot cooked rice or pastry shells.